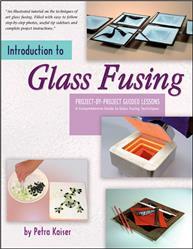 This book provides a good introdution to a number of fusing techniques, including working with frit, stringers and noodles; using slumping molds; using fusing paper to create imprints; working with dichroic glass; "freeze and fuse"; stamping and stenciling; drilling holes in glass; and fusing images onto glass. Each project requires the purchase of some accessory or another (a slumping mold, fusing paper, jewelry findings, etc. ), but you can tackle one project at a time and spread your purchases out, making it less painful on your pocketbook. Make clocks, barrettes, votive holders, flower vases, and over a dozen other items -- 20 in all. Most of the book is in black and white, but there are color pictures of every project. From The Vinery. 48 pages. 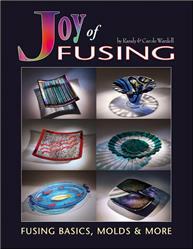 This book is aptly subtitled: A Comprehensive Guide to Glass Fusing Techniques. The first pages explain pretty much everything you need to know to get started with fusing: kilns and accessories, varieties of glass, even the simplest basics of how to score and break glass. The projects are a mix of the practical -- trays, holders and bowls -- and the merely decorative. There are over 200 color photos, step-by-step guides, an index and a section on troubleshooting. These projects are definitely not for the microwave kiln. At least an 8" x 8" kiln is needed for these projects. 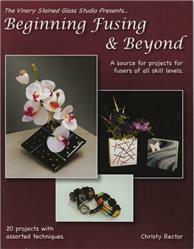 This book provides great tips on cutting glass strips, preparing different types of molds, and selecting a kiln, as well as organizing your materials (which we all could use some help with). Also includes help on keeping records and notes on firing schedules, so you'll know what will and will not work the next time you do a project. If you've only used a microwave kiln, you'll have to venture beyond your comfort zone to create the items in this book, because the projects require at least a 14 inch or larger kiln to make. Step-by-step instructions are given for 30 projects, which run the gamut: jewelry, platters, bowls, candle holders, and coasters. he projects have intriguing names like Bar and Stripes Tray, Hanging by a Thread, Lattice Weave Platter, and Candles in the Wind. There are also a few tutorials, such as on how to sculpture stringers, glass fritage, drop foot technique, fiber paper mold technique, multi stack full fuse technique, and stripe fabrication technique, Not only will you be working with fused glass to create these gorgeous items, but the author shows you how to use up the scrap pieces that are accumilating on your work bench as well as frit, stringers, iridized glass stringers and molds. The Fused Glass Handbook. by Gil Reynolds. Mr. Reynolds, after studying at the Pilchuck School in 1981, left behind his stained glass business of nine years and focused his energy toward the ancient art of glass fusing. Since that time, he and a handful of others, through countless experiments and information exchanges, have made public some of the techniques and secrets needed to successfully fuse glass. His study and involvement with fusing since its infancy makes Mr. Reynolds one of the nation's leading authorities on the subject.